Sam’s Club, Inc. has applied for a Conditional Use Permit and Variances to construct a new building on the site of the former Walmart off Highway 92 and Main Street in Woodstock, GA. Public Hearings are scheduled for July 10th & 28th, 2014. Review details of the CUP and Variances at Woodstock Planning Commission Case Files. Sam’s Club is a chain of membership-only retail warehouse clubs owned and operated by Walmart, founded in 1983 and named after Walmart founder Sam Walton. Its major competitors are Costco and BJ’s Wholesale Club. According to Woodstock Planning, the 136,455 square feet Sam’s Club building will face Main Street and replace the former Walmart which is scheduled to be demolished as early as this fall. 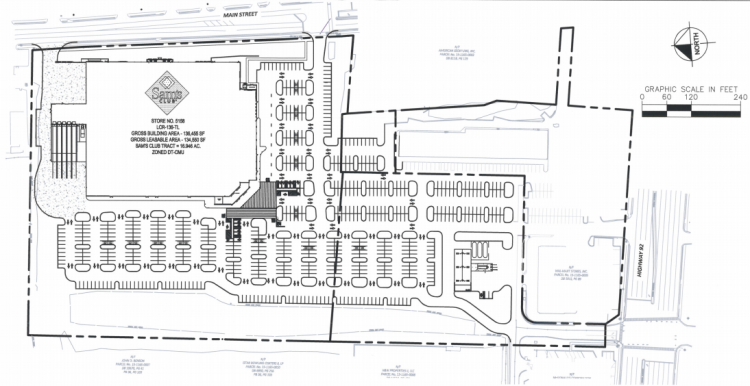 One of the variances Sam’s Club is seeking relates to the building exterior design “as no windows are incorporated in the design for the Main Street elevation. The warehouse club has high steel racks with merchandise stacked along the face of this elevation. The façade is broken up using (6) storefront elements of varying heights to match the grade along Main Street. Glass block is introduced in between the storefront elements to provide some light into and out of the building”. If plans go as scheduled, Cherokee County and North Cobb County residents will be shopping at Sam’s Club in Woodstock as early as next summer. Ground has been cleared and construction should start soon. We’re not sure of exact timelines, but promise to update when get more details on an opening date. please keep me updated as to opening date. Construction is well underway. They leveled the old Walmart and are now going vertical with walls for the new Sam’s Club. they’re moving fast thats for sure!!!! There’s a Groupon being offered now for reduced membership ($45) and some extras. Not sure whether to purchase… not knowing when the Woodstock location will open (and if they’ll offer an even better deal). Not sure how reliable it is, but just read elsewhere that they are hoping to wrap up construction by September 2015. So opening before the end of the year, maybe? Thanks for the update Rex. What’s your source? We’ve not been told, but will update this post as soon as we know more. Please let me know opening date, thanks! Is this Sam’s completed yet?